Walking with Jesus: Day 62: Acts 18:1-17 & Prov. 21:25-31 - Is Calvinism Biblical? Day 62: Acts 18:1-17 & Prov. 21:25-31 - Is Calvinism Biblical? And the Lord said to Paul one night in a vision, “Do not be afraid, but go on speaking and do not be silent, for I am with you, and no one will attack you to harm you, for I have many in this city who are my people.” And he stayed a year and six months, teaching the word of God among them. Throughout these devotional blog posts, I have avoided using specific theological labels. Today, I am breaking that pattern because today's text contains such a clear affirmation of two central and hotly disputed doctrines of what is commonly known as "Calvinism" (although John Calvin himself would hate that label; he never thought of himself as anything but a biblical theologian). At the heart of what most people think of when they hear "Calvinism" is a belief in an absolutely sovereign God, whose sovereignty includes the control of the "free will" actions of human beings. This absolute sovereignty of God includes the doctrine of election, the idea that God has chosen people to be His own. Many people who dislike Calvinism insist that it's a system build on human logic and not the Bible. The most obvious places to find the doctrines known as Calvinism are in Paul's letters, especially in Ephesians 1-2 and in Romans 8-9. But these are hardly the only places. Peter addresses his first epistle to "those who are elect" (1 Pet. 1:1). 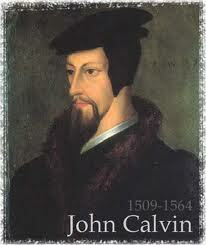 The Gospel of John is full of Calvinism, especially in chapters 6 & 10. The book of Acts has at least two clear references to election. The first was in 13:48, "And when the Gentiles heard this, they began rejoicing and glorifying the word of the Lord, and as many as were appointed to eternal life believed." (Read the devotional on this text.) The second reference is here in today's text. Think about the significance of what the Lord says to Paul in his vision in verses 9-10: Even though Paul is already facing opposition from many Jews in Corinth, Jesus tells him, "No one will attack you to harm you." How can the Lord promise this? It is only possible because God is sovereign over the actions of human beings, including the enemies of Paul. If this were not true, how could God protect any of His people ever? Then, the Lord tells Paul that He will protect him because He wants him to stay in the city for a while. Why does the Lord want Paul to stay in Corinth? He tells Paul "for I have many in this city who are my people.” At this point, there were very few Christians in Corinth. Yet God said "I have many in this city who are my people.” Who are these many? They are God's elect, His chosen ones. God's word is consistent and clear in the truth it teaches about God's sovereign reign over all things. If you want to think more about these issues, you can read my booklet on the Three Pillars of the Reformed Faith. Heavenly Father, Thank You for Your grace, which saves us from beginning to end. Thank You that You marked us out for salvation before the foundation of the world. Thank You that You called us to Yourself and that You keep us in Your love. We rejoice in Your absolute sovereignty! In Jesus' name, Amen. Heavenly Father, we have heard certain themes over and over again in Proverbs, expressed in different terms, using different imagery, but repeating the same core truths because we need to hear them. We need to hear them again and again. Lord, make us diligent and save us from being sluggards. Lord, keep us from lying and from wickedness. Make us honest and thoughtful. Give us Your wisdom, Your understanding and Your counsel, for You alone are God. You are the One who gives us insight and You are the One who gives us victory, In Jesus' name, Amen.